Lil Monkey and I had a discussion their other day about super heroes and he asked what super power did I want. At the time I went with something that he could thing was cool like blowing like the wind or laser eyes, but in reality, I want to have a super power that slowed time. All of me would chose that super power for selfish reasons, but depending on the day, they purpose would change. Slowing down how fast he is growing is one powerful reason that most any mom would want that ability, but at times when I am overwhelmed and have a to-do list so long I want to sit in the corner and cry, I'd like to manipulate time so that I could have a little "me time". Well, now you know why the blog has been quiet for a bit. I have a long list of things that I'd love to get posted, but alas, life has gotten a bit hectic in the last 2 weeks. Although the the Fall Issue of TEAinTEXAS is still on the newsstands for another month, we are already putting together the Winter Issue, which will feature Texas Antique Shops, Holiday Home Tours and (my favorite) a Holiday Gift Guide. I also volunteered at my son's new school to help organize the Fall Festival, but that has turned out to be a bigger project than I had signed up for. I agreed to head the Marketing Committee which was something that I do every day for TEAinTEXAS, but then the volunteers in the Ticketing and Volunteer Coordination teams dropped out and my team of two was given some of their tasks. AGH! Of course, life wouldn't be as exciting without a few bumps in the road. The actual event takes place the weekend after the International Quilt Festival ends, so I am going to be running like a crazy person through the second week of November, just in time for Thanksgiving! So, all in all, its been pretty hectic, but ... that doesn't mean I don't have time for a creative project or two. Especially a quick and easy Quiltsmart project! 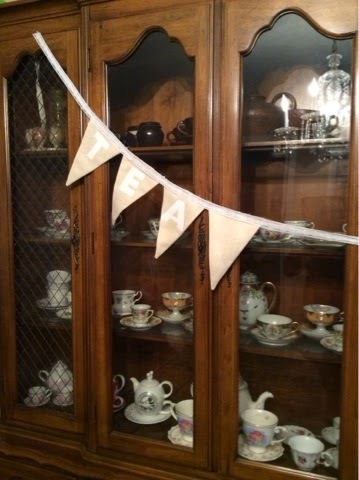 I made another banner, this one for my tea cup cabinet. I'm not going to sugar coat it, I'm in a burlap and lace kind of zone right now. It was so easy! 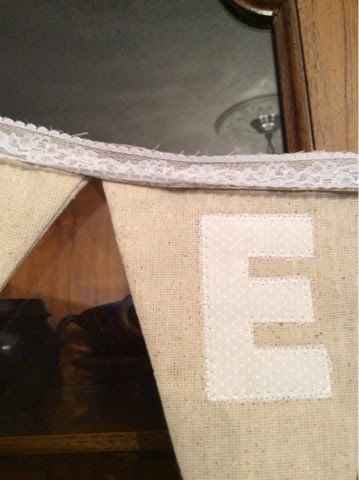 I used a soft burlap-style fabric to make the banner then a white-on-white fabric for the letters. I found a pretty, natural linen ribbon and a spool of same sized lace and sewed them across for the ribbon tie. Well, its a beautiful day here so we spent the morning at the beach after I met some of our partners in Galveston. I'll post pics of our adventures soon, but while the little one is resting on the sofa with a movie, I'm going to sneak over to the sewing machine where another Quiltsmart projects awaits!